IPL (intense pulsed light) is used for laser hair removal. It produces a high intensity flash of filtered light from the applicator head, which has been placed in contact with the skin. The energy from the light source is absorbed by the pigment melanin, which is the chromophore, which gives hair its colour. The hair rapidly absorbs this filtered light and transfers it to the surrounding cells. These, in turn are converted into heat raising them to a temperature of 70 degree Centigrade or more. The heating denatures the cells making them incapable of producing further hair growth. Dark hairs are most easily treated due to the high concentration of melanin that gives maximum absorption and conversion of light energy into heat. Very fair hair has less melanin and consequently less heat is produced, simply raising the fluence output from the IPL hair removal treats such hair. White hair has no melanin and cannot be efficiently treated. Ideally, hairs should be 1 to 2mm long when you come in for the laser hair removal treatment so it is possible to mark out the treatment area. If the hair is normally shaved and can be seen when shaven then you can shave right up to the day of treatment. Although plucking and bleaching should not be done. 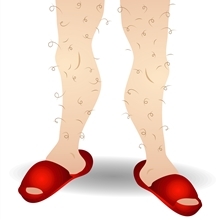 Avoid any other form of epilating and waxing 4 weeks before the treatment as it ensures that as many follicles as possible contain hair thus can be destroyed by the light. Why do hairs "grow" after treatment? Unlike other light depilation treatments, hairs are not vaporised by the IPL treatment. The heat kills the hair roots but the hairs remain in the skin and often become attached to the epidermis. They will fall out after 1 to 3 weeks as the epidermis renews itself. During this period it will seem that the hairs are growing a little faster as the epidermis pushes them out. What are the side effects to laser hair removal? The visible light should be completely safe, so no special precautions are needed apart from glasses for the brightness generated from the flash lamp. The skin of some people can be quite red immediately after the treatment and very rarely small blisters, like from excessive sun exposure, can occur. However, most people experience no side effects at all and the described skin reactions above usually disappear within hours to a few days. Unlike electrolysis, the IPL treatment is non-invasive. Only hair in the growth phase can be treated. The number of hairs in this phase varies from 20% to 90% depending on the body site. The lengths of the growth cycles also vary from 6 to 24 weeks depending on the body site. For most people, 3 to 5 treatments are sufficient to clear an area of hair. After the first treatment, most patients get a significant reduction in hair density - also, new grown hairs tend to become finer. Patients should avoid tanning 1 month ahead of the treatment, and immediately after treatment the skin is particularly sensitive to UV light and strong sunlight should be avoided for 4 to 5 days. Most authorities would agree that using current laser and IPL technology, it is possible to permanently reduce hair. Histology studies have found destroyed and denatured hair follicle cells in post treatment. A recent study showed that the percentage reduction in hairs after treatment using IPL systems are well above 80%. To achieve satisfactory results, depending on skin and hair colour, between 6-8 treatments is initially necessary and then the following maintenance should be considered. With IPL there is some preparation required in the weeks before treatment, along with after-care following treatment. Reputable practitioners will give you full information regarding both preparation and aftercare. Note: Always consult qualified practitioners to assess your suitablility for treatment.